A CORE SAMPLE is a specific sample a scientist chooses to do experiments on because they are interested in its hidden clues – its structure, properties, age and how it was formed. 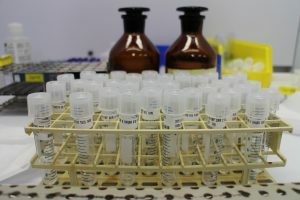 The scientists work on these samples either straight away using the JOIDES Resolution lab equipment (these are called shipboard samples), or they ship some home to their lab back on land for further analysis after the voyage (these are called personal samples). 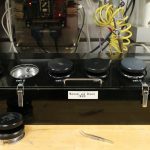 There is a moratorium for one year from the end of the cruise on the data collected during the expeditions and on anyone requesting additional samples from the core. So, for a year the scientists who sailed and a few approved shore-based collaborators have exclusive use of the data and cores, after which all the Expedition #375 data will be made public. The method involves marking an area of the core they want to sample with a toothpick “flag”, which has their personal label/name on it. It is a surprisingly home-made sign, and really colorful! 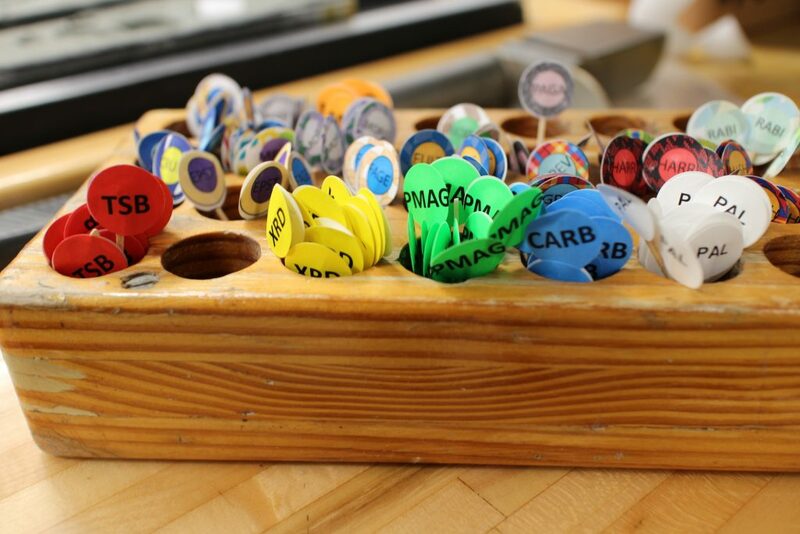 The labels sticking into the core mark where each scientist wants to take a personal sample from. We joke that it is like going to a buffet, choosing the best bits and then taking them to your table. The Shipboard sampling process involves every type of geologist we have on board – which is a lot! The geochemists take a whole round sample first (usually about a 10-20 cm long block) and test it for chemical compounds and elements. One set of analyses include testing for gases such as methane as required by our safety protocol. If the concentrations of certain hydrocarbons reach above a certain threshold, then we would stop drilling a hole immediately and before the hydrocarbons reach dangerous levels, as the ship is not designed to drill into gas and petroleum rich areas. The geochemists also extract fluid from the core and conduct several chemical analyses. They look for elements and trace minerals in the samples that tell us where the fluid came from and what conditions are like under the seafloor. The paleontologists get the ‘core catcher’– this is the bottom section of each 10 m long core, holding the oldest sediment. They wash it and sieve out the tiny plant and animal microfossils which they can then magnify by 100-1000x – the fossils are then compared to the geological fossil record to help us determine the age of that particular core sample. This way we know when the sediment was deposited, and in some cases what the water depth and ocean water conditions were like when those organisms lived. They also take personal samples home with them for further experiments and analysis. 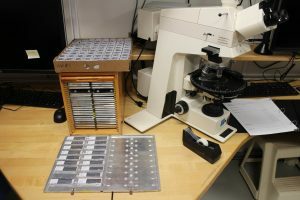 The paleomagnetists take oriented samples so they can find the magnetic field ‘imprinted’ like a barcode in each core. They use an impressively-named machine called a cryogenic magnetometer to do this. The Earth’s magnetic field has flipped back and forth over millennia, and we have a record of these reversals to compare our cores to. Their work helps us date the cores, and this information is added to the dating work done by the paleontologists. The physical properties team measure the density, gamma radiation, magnetic susceptibility, thermal conductivity and how earthquake waves move through the sediment. This tells us what environment the sediment comes from – did they originate from the land or sea for instance. Other questions their samples might answer is how does this particular core behave in an earthquake? How does that compare to the core samples taken higher up in the layers, or further down? 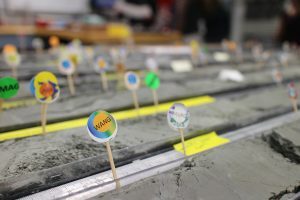 The sedimentologists and structural geologists work together to visually describe the lithology and deformation (the general physical characteristics) of the layers in the cores. They can see fine and coarse sediment layers, faults, ash layers, mineral deposits, and evidence of organisms living just below the seafloor. They let the rest of the core lab team know these characteristics so they all understand the general physical condition of the core, and what the different colours, shapes, patterns and textures mean. The Hikurangi subduction zone is like a puzzle we want to solve. There are some areas of this long subduction zone that are experiencing slow slip earthquakes (‘creeping’ earthquakes happening annually over a few weeks which we don’t feel on land), and other areas that are ‘locked’. Each person brings with them a different lens through which they examine this problem. Combining their expertise, both on the ship and later back at their labs, we all hope to complete (or at least fill in more!) this puzzle of the Hikurangi subduction zone.